Radio automation systems make sure your station is always on the air and sounds good. They manage playing jingles and ads on time, putting up playlists for when no DJ is playing, and taking over if things go wrong with your live broadcast. When you can't have a DJ doing a live show you have to fill up the time somehow. Instead of using third party tools that rely on low-tech solutions such as CSV files and remote FTP folders, Radiojar gives you powerful web tools. When the broadcast link goes down or a DJ doesn't turn up to do their show, the default Pilot kicks in and saves the day. Use text search to match any song attributes. You can use artist names, album names, tags or free text search to match tracks. You can use any tags you have created and assigned in the Media Library to match tracks. Pilots give you an estimate of how many different playlists they can generate with the rules you've set. Set limits for repeating the same artist or the same song. Radiojar's powerful Web Automation and DJ Management features will make sure that there are no gaps in your audio stream, tracks and shows will cross-fade smoothly. Radiojar is the only web-based automation service that gives you the tools to schedule specific jingles & ads to play at specific times, without having to include them in playlists. You can change the promo messages at any time and have complete control on how they play on your station. 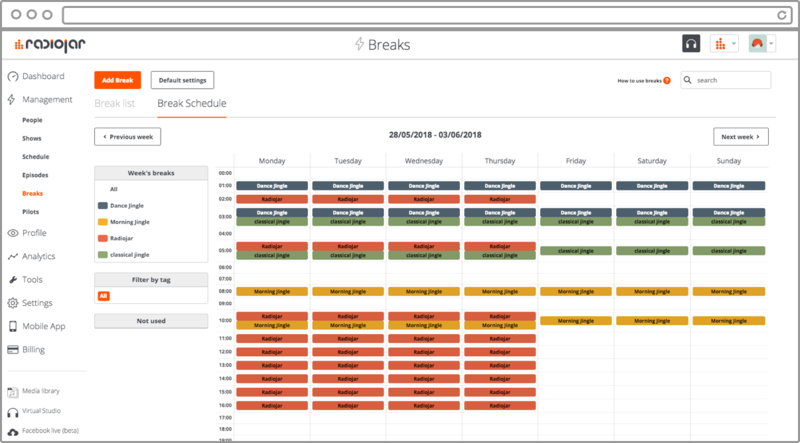 You can have a weekly overview of all your breaks. Breaks can play as often as you like, but only on specific slots that you designate. You can create break items that select one from a set of specified jingles/promos in random every time they plays. You can have multiple break items with different activation and expiry dates. Set the order of your jingles and commercials any way you want, for every break slot. You can choose whether to interrupt the playing track and play the break items on time, or wait for the last track to finish. You can choose whether to continue the interrupted track or continue with the next one. If you are using DJ Management, you can select whether breaks will interrupt your show or not. Radiojar allows you to create precise schedules for your radio station. You can control what goes on air and when, and at the same time control DJ access. You can schedule live shows, fixed playlists or Pilots. At the times when there's nothing scheduled, the station's default pilot takes over. The scheduler works in conjunction with Radiojar's DJ Management to give you control over who has access to do live shows. Scheduling is easy: Just drag and drop items in place! Change the colours to suit your liking and make it cleaner. Create items that repeat daily, on weekdays or on weekends. Items can expire on specific days or after a specific number of occurrences. You can give access to the scheduler to administrators, station DJs or even to any Radiojar DJ. DJs can access Radiojar (through the web interface or a direct link) only during the times of their scheduled show. The scheduler supports different time zones to allow collaboration with DJs around the world. You can choose to rebroadcast from another source/stream and schedule accordingly these rebroadcasts. Every station hosted on Radiojar can take advantage of our modern and fully customizable widgets, including: player, listeners' map, chat and more.